I would guess that about 85% of all Limoncello I have ever consumed has been home made, and most of that by my aunt. As a result, whenever I taste its mass-produced counterpart I am always disappointed. In France and Italy, it is very easy to get hold of 40% ABV alcohol for making your own spirits. In the absence of such things in the UK, good quality, high alcohol vodka makes a reasonable subsitute. This is my aunt's recipe, which is so easy to make. While it requires a little sitting time it is always worth the wait. I used Amalfi lemons, which I got from the fantastic Andreas Veg in Chiswick, to make it as authentic as possible. If you are unable to get hold of these, just use the best quality organic unwaxed lemons that you can get your hands on. Using a sharp knife, peel the lemons to remove the rind. Take care not to bring any of the pith away with you as this will impart a bitterness to the Limoncello. Pour all the alcohol into a large sealable container and add the lemon rind. Stir well, seal the container and store in a cool dark place for 10 days to two weeks, stirring every few days. Once the rind has fully infused with the alcohol, you are now ready to assemble the Limoncello. Warm the water in a pan then gradually pour in the sugar, stirring until it is all dissolved, then leave to cool. Once cool, pour the alcohol and lemon rind through a sieve (to catch the lemon) into the sugary water, stir well and then transfer into bottles. Let it sit for a further week or so, then leave it in the fridge or freezer ready for use. 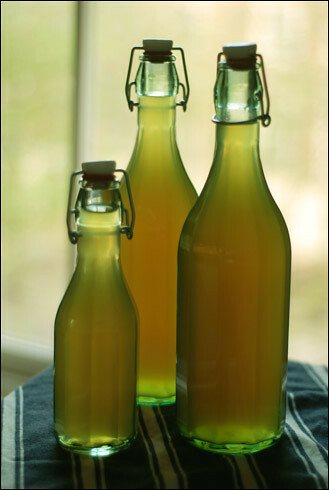 Homemade Limoncello will keep for up to a year, so it makes an ideal (and wonderfully personal) birthday or Christmas gift. This looks amazing. I'm always looking for new alcohol recipes to try, since I started to react badly to cheap chardonnay.